If you want to do well in Modern you have to master your deck. Everyone who ever gives advice about improving in Modern says exactly that. There’s no way around it—in the non-rotating formats you are much better off playing one deck every tournament. Higher deck diversity, power level, and complexity mean that raw play skill is insufficient to win. Players have to be experienced with their deck as well. The problem for many is that finding your Modern deck is hard. If you don’t have a preferred playstyle it is even harder. Worse, some players don’t enjoy sticking with one deck tournament after tournament. They like switching decks, either due to getting bored playing only one deck, or because they want to find an edge on the metagame. I understand that sentiment and sympathize with their frustration. It’s fun to explore and look for an opening nobody is exploiting. The problem is that Modern’s speed and diversity make that extremely difficult. The latter means that whatever angle you’re exploiting has, most likely, already been explored and exploited. This is one reason Lantern Control is so unique. The former limits the time you have to exploit that angle. It doesn’t matter how open the format actually is to your deck if it cannot execute its gameplan before Infect kills you. This ruthless efficiency weeds out most attempts to game the system and innovate in Modern. However, it is not impossible. The rise of Lantern Control last year proves that there are undiscovered decks in the Modern cardpool, just as Bedlam Reveler underscores the importance of innovation and adaptation. The problem is that most players have the wrong approach to metagaming in Modern. The problem for most players is that when they think about metagaming they are thinking about Standard. That format rewards and even requires adaptation. It’s just a kind of adaptation that doesn’t translate over to other formats. I believe from conversations with frustrated players that most players think of metagaming as being Brad Nelson during Theros-era Standard. The story, as I remember it, goes that Brad realized that the Standard metagame was built around the scry lands. This coupled with the power of Nykthos, Shrine to Nyx and devotion limited the number of decks possible in Standard. In turn it meant that while the metagame was dynamic, it was cyclical and predictable. By identifying where a given tournament would fall along that cycle, he was able to identify the best deck for a given week, and then build that deck to only include the good cards for that tournament and be sure he would see them. As a result he was an absolute win machine on the SCG Tour. Naturally, players want to emulate that feat. The problem is that Theros Standard was as solved as any format can be, making that kind of metagaming easy. Modern and other Standards are orders of magnitude more complicated. Standard will shift weekly, and frequently in dramatic fashion, with certain decks being completely unviable one tournament and unbeatable the next. That rarely happens in Modern. Any deck is viable and likely present at a given tournament. This difference between expectations and reality are what fuel the frustration. The other problem is lag time. You used to hear about it constantly, though rarely by name, when we had PTQ seasons instead of PPTQs. It still happens, but you don’t hear about it as much. Most writers don’t talk much about the PPTQ grind so you only notice it when there are a string of SCG Opens and GPs running the same format over several weeks. What do I mean by lag time? A dictionary definition says it’s a period of time between two closely related actions. In Magic terms it’s the time between when data is created and made available and then acted upon. 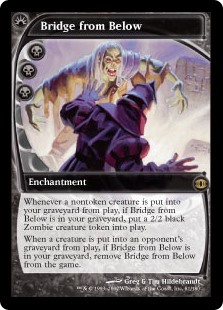 I first noticed this as the Dredge Cycle in Extended, but it happens in every format during competition season. What was the Dredge Cycle? During the first few weeks of the Extended PTQ season, Dredge was non-existent in the Top 8 results. The format was undefined and so players had to be ready for anything and packed their hate. After the first few PTQ’s were posted, players would start to adapt to the information, changing their sideboards or decks from what was good against last year’s decks to the decks they actually saw winning. As a result Dredge hate would start to disappear until there was a tipping point and suddenly Dredge won everything one week. The following week the hate would return and the cycle would continue. Those who reacted to the incoming data were always behind the curve. But those who anticipated the cycle were always ready the week when Dredge came back and got free wins thanks to their preparation. The results that you saw posted described what happened the previous week, and the reaction that you have to those results is what is going to happen this week. If you want to be ahead of the curve, take advantage and actually metagame for the tournament, you had to react to the reaction. To appropriate a saying: to be ahead of the trend is to be on the trend. To be on the trend is to be behind the trend. To be behind the trend is fatal. In Extended, the smart metagamers were actually operating opposite to the Dredge Cycle. Anticipating Dredge players staying away from early tournaments when players were prepared for anything, they wouldn’t play their Dredge hate. As the season wore on they started running hate as others took it out. I think of this in graphical terms. Say the red line represents a given metagame trend. If you are trying to game the trend, you don’t want to be anywhere close to the trend. Instead you want to be opposite of the trend. Using the Dredge Cycle example, when the format is at peak hate, you want to play no hate and use the extra sideboard slots to beat everyone else. This obviously takes a great deal of metagame knowledge and skill, but historically the rewards have been great when you succeeded. Of course, if you tried to fight the trend and got it wrong you’d be in for a very rough tournament. The problem with Modern is that even if you overcome both the data and lag problems, and identify where the trend is heading, you still may be off. You see, despite what detractors may claim, the Modern metagame does shift and goes through dynamic cycles. It just does it slowly. Standard will rapidly cycle throughout its lifetime. It has to; its time is short especially with the new rotation schedule. The non-rotating formats are theoretically immortal and can take their time with their shifts. The overall Modern metagame trend does look like the graph above, but only over the course of a year or more. Any individual month will only see a very small portion of the cycle, and as such it will look like a pretty flat line. If you still have your graphing calculator you can see this yourself by shrinking down the scale on a sine wave. At normal scale it looks just like the lines above. At reduced scales, even the steep parts of the curve will look pretty straight. Therefore it is easier to overshoot the trend in Modern by metagaming too hard. Your analysis of the trend may be correct, but players may not be moving as quickly as you anticipate and suddenly you’re out of position and struggling to get a win. Why does this happen? Part of it is competitive pressure; there are fewer Modern events in a year so there’s less pressure to adapt and innovate. Part of it is the difficulty in changing decks due to the aforementioned need to master your deck and the expense involved in owning multiple decks. Part of it is power level. Standard’s lower power means that there’s more room to maneuver and reposition yourself compared to Modern’s ruthless efficiency. Regardless of the why, the simple fact is that it is harder to game Modern than it is Standard. But it isn’t impossible. We’ve seen plenty of instances of correctly gauging metagame trends in the past year, whether it was Todd Anderson’s Infect run or the Lantern and Living End surges during Eldrazi Winter. Being successful at metagaming frequently comes down to knowing which answers will be present in what quantities at a given tournament, and that isn’t always possible. I prefer a more subtle approach. I’ve written about this method quite a bit though never by name. In my PPTQ report, I mention coming prepared to use Harbinger of the Tides instead of Spell Queller if the meta looked right. This is flex slot adaptation. Every Modern deck has an unchangeable core and then some flex slots. Most of the time the flex slots are used to close holes in the core, but you can also use them to subtly reposition yourself relative to the metagame. Consider Affinity. Recently the trend has been to play Galvanic Blast as your non-artifact spell due to an open but aggressive metagame. Say instead you deduce or learn that the next tournament you go to will feature a higher concentration of combo decks and Jeskai control. That Galv Blast is not going to be very effective at that tournament. Instead you could cut your Blasts for Spell Pierce, which are bad in the overall meta but much better against the spell-based decks you expect to face. That’s flex slot adaptation. Simple, straightforward, and effective. How effective the method is depends on many factors, but I prefer it because it’s safe. Flex slots are a tiny portion of a Modern deck, so the impact on an average game will be small. A deck’s core should be powerful enough to give it legs against any deck, even if it isn’t favored. Playing the wrong card in a flex slot hurts less than misbuilding the core of your deck. The percentage may be small, but it can be enough to boost you to a win. Of course, that’s less metagaming than it is tuning. I’m usually okay with that, but more dedicated metagamers need something more. The key is to recognize that you are hedging rather than truly shifting your win percentages. In my PPTQ example, I knew that the overall metagame would be very open and that I needed to be ready for decks from all over the spectrum. What I was looking for was a way to hedge against slight warps in the meta for that tournament. Contrast this with my Regionals preparation where I was more strongly prepared for aggressive decks. With this method, you’re looking to get a small edge in a few games rather than setting yourself up against the meta. A more visible method of gaming a tournament is to bias your sideboard against a certain deck or types of decks. You may know that more fair decks will be present than normal, which leads you to take out specialized answers for card draw to win the grind fest. Weird looking sideboards that leave you wondering, “How does <deck> beat <deck not sideboarded for>?” are frequently the result of this technique. Using our Affinity example again, knowing what we do about the expected metagame might lead us to take out anti-creature cards from the sideboard in favor of more Thoughtseizes and Spellskites than normal. This makes the deck worse against the overall meta, but it will give us an edge against the expected meta. It doesn’t matter how open you suddenly are to Jund or Burn if you never see them. If you guess right and have the right sideboard for what you face, it doesn’t matter how “wrong” it is in reality. This is also the problem. If you’re wrong about the tournament meta, you will suffer, far more than with the previous method. Biasing your sideboard leaves you more open than normal to matchup variance, and sometimes that deck you didn’t expect to see will be there. Maybe the pilot doesn’t have anything else to play; maybe they know something you don’t. Either way, you were wrong, you weren’t prepared, and you lost. The other problem I encounter is that players don’t always go far enough with this method. Altering your sideboard is a fine thing, but if you really believe you’ve got the read and are willing to commit, why not go all the way? Combine your biased sideboard with adapted flex slots. Back to Affinity, changing the board is all well and good, but leaving Galv Blast maindeck is an admission that you could be wrong. If you are wrong then you shouldn’t have done it in the first place and if you’re right you gave away win percentage out of fear. If you’re hedging and leaving in cards “just in case,” then do you really believe you have the right read? If you really don’t then you shouldn’t be metagaming in the first place. Fortune favors the bold—if you’re going to game against the meta then game against the meta. No fear! Finally, the rarest of successful Modern metagaming strategies: just play something else. I know that I said you need to master a deck to succeed in Modern. This isn’t actually antithetical to that idea. You have to be like Todd Anderson, who normally played Twin decks but was also practiced and experienced enough with Infect to run it successfully when the meta called for it. I realize that this requires a lot of time and money to pull off, but if you do it will be rewarding. To be most successful you need to have mastery of two very different decks. I recommend one fair and one unfair. You normally play one deck, but when the meta is more hostile to that deck you pull the other one out, evade the hostility and take advantage of the warped metagame. Is this easy? No. Is it effective? It can be. Metagaming is hard, and it gets harder as cardpools expand and power rises. Trying to game a Modern tournament the same way as a Standard tournament is more likely to end in failure than success. However, there are ways to do it and learning when a method is appropriate will produce some extra wins. Do you have another method I didn’t mention? Let me know in the comments and I’ll see you next week! The tip about having a fair deck and an unfair one if you’re going to switch is a good one. I’ll keep that in mind. Agreed, that is really insightful. I might even take it one step farther and say that you might choose a secondary deck that can specifically prey on the decks that shut down your primary deck. Try and map out what decks are good against your number one deck, and figure out what decks are good against THOSE decks. If there’s a recurring deck that beats many or all of your main disadvantaged matchups, that might be the deck to buy into as your secondary. Honestly you dont even need 1x Fair + 1x Unfair deck. You just need two decks that attack at different axis’s. Having Naya Zoo+Merfolk isnt exactly going to give you a ton of options. WHile having Zoo + Blue Moon gives you many. Same for Blue Moon + Storm ect ect. Meta’s generally shift into favoring 2 of the three ( Aggro, Combo, Control ). How much combo control or aggro combo shifts are seen is the hard part to predict.